Well, ladies and gentlemen, we’ve officially hit the fall, even though it’s currently nearly 90 degrees outside and feels like July still. What that means for the wonderful world of bridal gowns is that we’re also entering trunk show season! It’s a phrase you’ve probably heard tossed around a lot as you’ve begun looking for your dream dress, but a lot of brides aren’t exactly sure what it means. So what, exactly is a trunk show? It’s a chance to see the full collection from the newest season from a certain designer, just for a weekend. As a boutique, whenever a designer we carry releases a new season (usually twice a year) we order into is, based on what styles we thing we’re missing and our brides would like. We never order the full collection– an entire new season is usually between 15-20 gowns, while we as a store might order maybe 8 or 9 of them to carry as samples. Trunk shows are an opportunity to see all of collection from a designer you’ve researched and loved, rather than chancing that our store has ordered the one(s) you’re interested in. Oftentimes, these trunk shows will come around to the store in advance of us ordering in the samples we did chose, so you might get the chance to see new dresses earlier than you would otherwise as well. A couple of things to note– these dresses are usually straight from the runways at the various bridal shows, which means they’re often not in pristine shape, and we have no control over the sizing. We always do our best to clip the sample gowns to you to get as close as we can to the proper fit, but many trunk show dresses do run on the smaller size. We do however carry trunk shows that come specifically in plus size, such as the Essense of Australia Every Body Every Bride show we have coming up the first weekend in November. In terms of order process, it’s a little bit different than usual as per a trunk show. We know many of our brides when finding a dream dress like to take a few days to think over their decision to make sure that she is making a choice she’s confident in. Just remember that trunk show dresses are only there for the weekend, usually Friday through Sunday. While some designers do offer loaner programs for a selection of their gowns, trunk show dresses are usually too new to be offered under these programs– this weekend will likely be the only time you’ll be able to see the gown until your order would come in months later. Even more so than on a regular day, pictures are not allowed to help you remember what a dress looks like, unless you purchase your gown during the trunk show. The shows are always the newest designs, and intellectual property of bridal gown designs are highly protected. We can always order a gown you saw with us at a trunk show at a later date, just know you might only have one chance to see it! 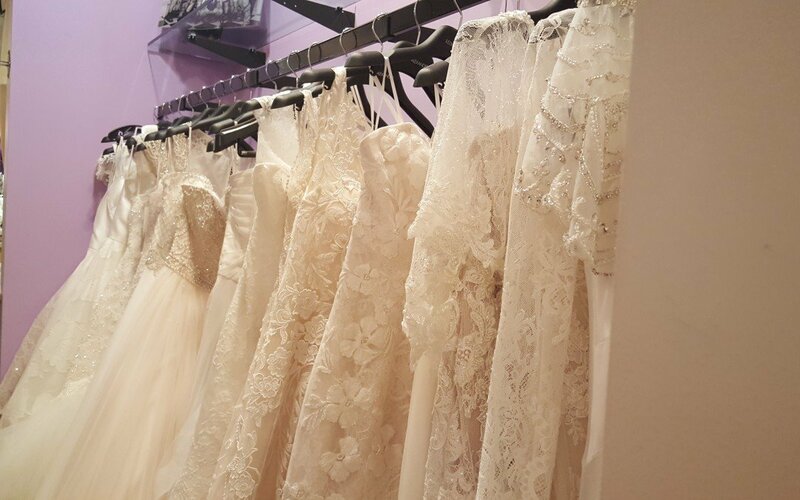 If you’d like to come in and get a first hand look at all the newest gowns from our favorite designers, trunk show season is just starting and in full swing through November! Call us or schedule an appointment online to see some great gowns with us soon!